I actually searched online to see if anyone has posted this recipe before and I’m quite surprised I didn’t find any matches to my query. I’m guessing this is only native to my hometown in the southern part of Cebu province in the Philippines. Dalaguete is known for its banana meat (banana stuffed with ground pork), podrida (a crumbly cookie filled with luscious and fruity filling), torta (a spongy mini cake with pork lard), and tostado, among others. 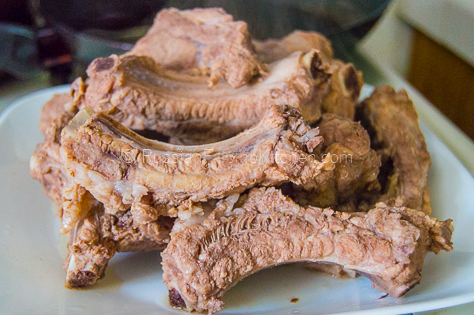 Filipinos are known to be pork eaters, so it’s no surprise Philippine cuisine include many dishes made from pork. 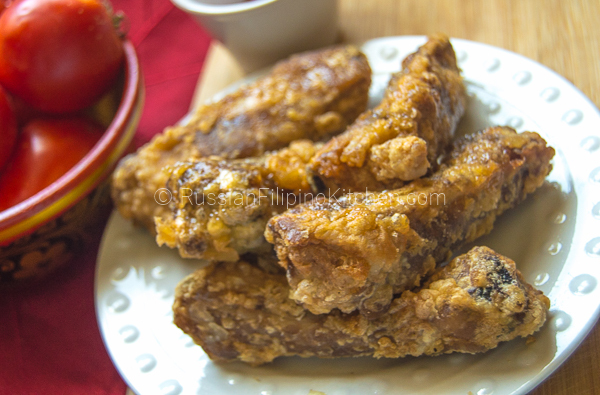 This breaded pork ribs recipe is my mom’s which I wrote down from memory. We always had this during fiestas and other celebrations. A fiesta is a grand celebration in every town in Philippines honoring a patron saint, and which is synonymous to eating and merrymaking. My version is very close to how my Mama does it. Probably the slight difference is in the use of vinegar (in Philippines we use coconut or sugarcane vinegar, while in the US I use distilled vinegar made from grains). But the difference is very subtle. 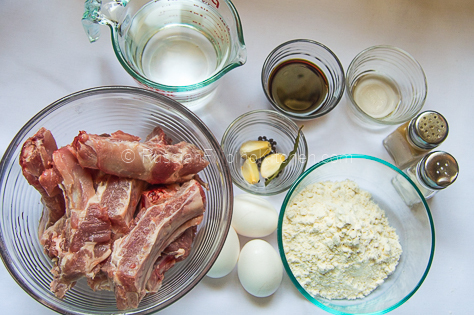 If you are looking for a new pork ribs recipe to try, this is it. Basically, the ribs are first simmered in a concoction of water, soy sauce, vinegar, and spices to soften and add flavor to the meat. 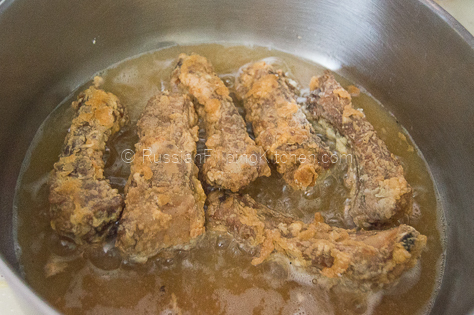 Then it is coated in an egg and flour batter and deep fried until golden brown. This will make a perfect appetizer! 1. Arrange pork ribs in a cooking pot and add water, soy sauce, vinegar, peppercorns, bay leaf, and garlic. Bring to a boil. Once it starts boiling, lower the heat to medium low and simmer for 30 minutes or until the meat is soft enough to pierce with a knife or fork. 2. Use a kitchen tong to transfer rib pieces from the pot to a plate or bowl. You can discard pork stock if you want. However, I personally use it when making pancit, as it adds great flavor to the noodles. I strain the stock and set aside to cool down before transferring in a container to refrigerate or freeze for later use. 3. Prepare breading mix. In a flat plate, mix together flour, salt, and ground pepper. Beat eggs in a separate bowl. 4. Heat oil in the fryer or skillet. 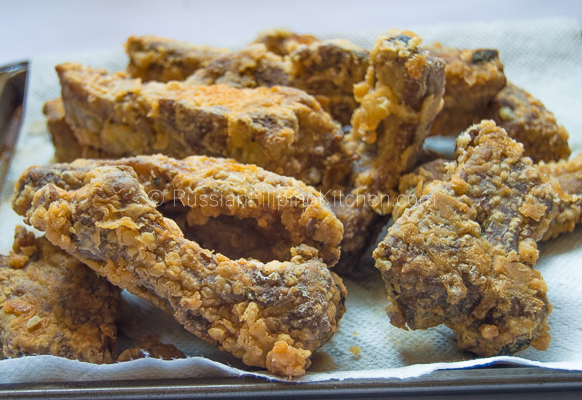 Dip rib pieces in egg, coat in flour, and drop onto fryer/skillet. Fry for about 3 minutes or until it turns golden brown. Drain in paper towel to remove excess oil. 6. Serve with favorite dipping sauce. 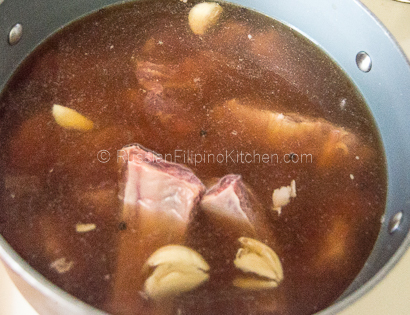 Arrange pork ribs in a cooking pot and add water, soy sauce, vinegar, peppercorns, bay leaf, and garlic. Bring to a boil. Once it starts boiling, lower the heat to medium low and simmer for 30 minutes or until the meat is soft enough to pierce with a knife or fork. Use a kitchen tong to transfer rib pieces from the pot to a plate or bowl. You can discard pork stock if you want. However, I personally use it when making pancit, as it adds great flavor to the noodles. I strain the stock and set aside to cool down before transferring in a container to refrigerate or freeze for later use. Prepare breading mix. 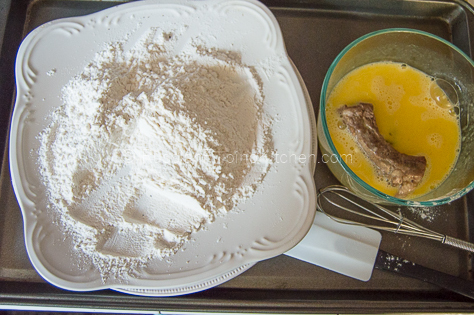 In a flat plate, mix together flour, salt, and ground pepper. Beat eggs in a separate bowl. Heat oil in the fryer or skillet. Dip rib pieces in egg, coat in flour, and drop onto fryer/skillet. Fry for about 3 minutes or until it turns golden brown. Drain in paper towel to remove excess oil. It’s a Visayan pork dish specifically from my hometown in southern Cebu. You should try making it when you have time. I love this since i was little.. but now it’s been hardly served during fiestas in our home as far as can i remember.. 🙂 cheers!